The “Best of #SNIC19” Webinar Series is All About Staying on the Cutting Edge of Trends! Our keynote and general session speakers from #SNIC19 are industry known contributors to major media outlets and they are bringing their latest forecasts and trend lists to you live, in our “Best of #SNIC19” webinar series. Maeve Webster, Foodservice Trends Expert & President of Menu Matters, will start off the series with telling you what your customers want. Kim Lear, Generations & Workforce Strategy Expert, will then explore workforce trends, to help you engage and retain your staff. Then, innovation expert Daniel Burrus will reel it all in by teaching you how to anticipate and stay ahead of trends to accelerate positive results across all areas of your business. Best of #SNIC19: It’s Your Business! #KidsToday: What Do They Want? Join foodservice trends expert Maeve Webster for her in-depth insights into what kids want and demand from restaurants and retail experiences. Learning about kids’ expectations outside the school will help you exceed them in the cafeteria. Webster will also offer her thoughts on some of the “whys” of today’s trends, which will help you build your own forecasting skills and stay on the leading edge. Successful completion of the webinar and quiz is awarded 1 SNA CEU, or 1 CPEU for RDs/DTRs. We are in a period of great change in the workplace, and the time has come to challenge conventional thinking about recruitment, retention, engagement and leadership. Join workforce strategist Kim Lear as she decodes the key trends shaping the future of work for every generation with a mix of data, storytelling and humor. Take away will be focused on hot-button issues such as recruiting in a competitive landscape, creating collaborative workplaces, retaining employees and more. Learn how to separate the “hard trends” that will happen from the “soft trends” that might happen. 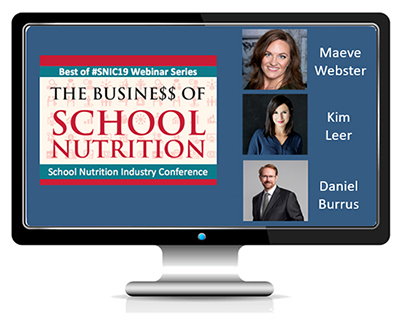 Join innovation expert Daniel Burrus as he explains what it takes to accurately anticipate technology-driven disruptions before they occur, prep to meet customer needs before they express them, and identify game-changing opportunities for school nutrition programs.